1. Preheat the oven to 180°C, gas mark 4. Place the butter, sugar and golden syrup in a pan over a medium heat, and stir until the mixture is fully melted and combined. Meanwhile, in a large bowl, whisk together the dry ingredients and a pinch of salt. Pour the melted mixture into the flour and, using a wooden spoon, mix to form a stiff dough. Use your hands to finish the mixing, kneading gently to a smooth, uniform dough. Cover the slightly warm dough with cling film if not using immediately. 2. Roll the dough between two sheets of baking parchment until 0.3cm-0.4cm thick. 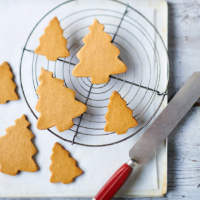 Using different-sized Christmas tree (or any festive) cookie cutters, cut out as many trees as you can, then carefully transfer to a parchment-lined baking tray. 3. Bake for 10-15 minutes or until lightly browned around the edges. Leave on the tray for 5 minutes, then transfer to a wire rack and cool completely. To decorate the cake, simply press 2-3 different-sized trees into the top. Store any leftover biscuits in an airtight container for 7-10 days. To turn the extra biscuits into decorations: before baking, use a straw to cut out a hole at the top of each tree. Once baked, place a loop of string through the hole.